Way back in March 2009, I bookmarked an article in the AJC about a new doughnut shop in town. The shop had already been open a number of months before the AJC picked up on the growing Atlanta doughnut-lust. I thought to myself, yum, this sounds good. And then I forgot about them. That happens when you have too many restaurant to-do's on your list, I guess. A year later, I started hearing about a Cypress St. Pint & Plate ridiculous doughnut hamburger creation, courtesy of that very same shop. Enter heart attack, but I heard it's very, very worth it. Finally, all this time later, today I decided to try out this local foodie favorite -- Sublime Doughtnuts. ... as a little birthday treat for my mom :) She is a teacher at a north metro school, and they were having their open house today, on her birthday! 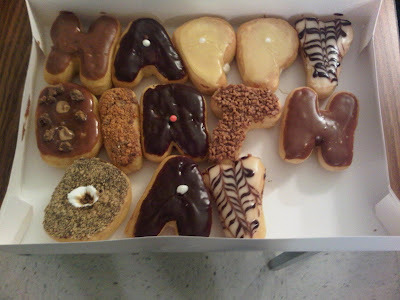 So before all the little kids started running the halls, I showed up with this box, and she and her teacher-friends just went nuts over how awesome these doughnuts looked -- and tasted! Reese's Peanut Butter Cup Doughnut (see: letter B) -- you are my new sweets daydream. I feel you might only be topped by your Toasted S'mores brother in crime (see: letter D). But I will have to revisit to test this out. Looks so cute and so YUM!! And I am not even a fan of the doughnut. Cindy - I am not typically a doughnut fan either but goodness, these almost count as some other dessert food altogether, they are so creative and delicious! We were at Cypress St on Friday and I tried convincing my boyfriend to get the donut burger. We had read about it beforehand... He passed this time, I think because he wasn't interested in the heart attack that night. I am very curious to try it. I've also been dying to try sublime donuts! There are too many restaurants in atlanta...! Hahah E - next time you and I both are going to have to convince someone to try that delicacy, perhaps to split instead though and save ourselves the heart attack!